Asia Pacific Attapulgite Market analysis based on End-User, Product, Industry Analysis Report, Regional Outlook, Application Development Potential, Price Trends, Competitive Market Share & Forecast, 2018 – 2024, as reported in the latest study by Graphical Research. 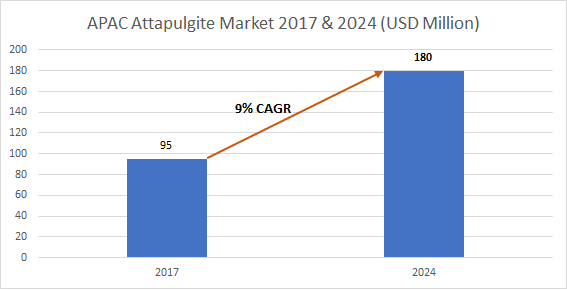 Asia Pacific Attapulgite Market estimated to reach USD 180 million by 2024. The market will be highly driven by the growing demand for binding, suspending and stabilizing agents in agricultural sector across the Asia Pacific region by 2024. The product is extensively used in agricultural sector as binding agent for fertilizers, as a carrier in wettable granules for agrochemicals such as herbicides and pesticides. Huge agrarian economies in this region such as India, China and Indonesia will generate notable market for attapulgite-based agrochemicals in future years. Attapulgite (palygorskite) has exceptional absorption qualities and can absorb up to 200% of its own weight in water owing to its porous structure, lesser density and laminar granules. The product features including: quick solidification after wetting, removal of foul smell and the prevention of bacterial growth makes it an ideal raw material to manufacture pet litter absorbents, especially for indoor animals such as cats and dogs. Additionally, the product helps to restrict the bacteria growth with the help of antibacterial agents and also reduce the dust content. These factors will strongly support palygorskite market growth in forecast timeframe. Colloidal grade will grow with a CAGR exceeding 10% over the forecast period. The product is mainly used to form gel structures in fresh and salty waters. This makes it suitable for the several industrial applications which include binding, suspension, absorbent and reinforcement. Cat litter absorbents segment led Asia Pacific attapulgite market with a substantial share above 30% in 2017. China is reportedly the second-ranking country in terms of cat ownership and the country’s pet industry is likely to witness a substantial growth in the next seven years. Such trends will positively influence the product demand for producing cat litter absorbents by 2024. Some significant industry participants include: Ashapura Group, Manek Group, Xuyi Botu Attapulgite, MinTech International, Jaxon Filtration, etc. These small and medium contributors accounted for over 25% of the overall attapulgite market in 2017. Discovery of vast reserves of palygorskite in Xuyi province in China with 890 million tons followed by the government efforts to exploit it, Asia Pacific Attapulgite market will witness robust potential by 2024.